Over the years I have found that seeing old race cars for the first time in ages is a bit like bumping into an old flame or at least I imagine that’s what it might be like as most of poor ladies spotted me first and dodged the bullet. However there is a natural tendency for us to don the rose tinted spectacles, remember the good times and forget the bad. Racing imitates Life. A while back I was a guest of Porsche AG at their Leipzig Factory. Like all good hosts they made me feel very welcome and when they showed me up to the museum/display area it was an opportunity to meet up with some old friends, the Dauer 962, the TWR Joest WSC and of course the Champion Porsche 911 GT1 Evo, chassis 005. The distinctive livery of Dave Maraj’s team is unmistakable, having graced many Porsches and Audis in endurance racing both sides of the Atlantic, culminating in a overall win at Le Mans in 2005 as well as multiple ALMS Championships. Not only did I get to shoot the 911 but none other than Norbert Singer explained what made this car special. 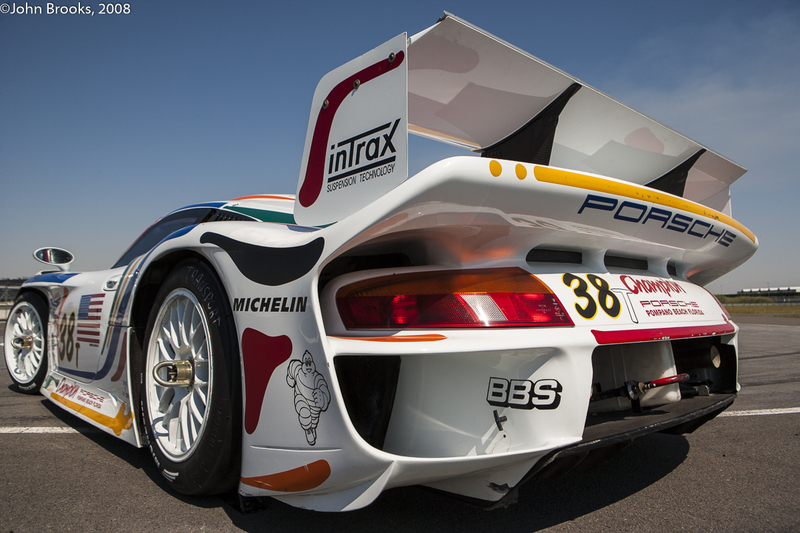 But back to the 911 GT 1………..where did it come from? What caused this evolution of the iconic 911 to be created? 1991-1992 saw the premeditated destruction of Sportscar World Championship by the FIA under the control of Mosley and Ecclestone, with some collaboration from Ballestre and Todt. They were determined to promote Formula One at the expense of endurance racing, only Le Mans was strong enough to survive. The final FIA SWC formula of 3.5 litre engines cars and high tech machines proved way too expensive even for manufacturers and there were no cars for privateers to buy, despite a valiant effort from Lola, so the grids dwindled to single figures. There were projects from Konrad, Brun, Allard and BRM but they were too little, too late and always grossly underfunded. The impulse to race long distances as opposed to sprinting still existed and, as ever, where there is a will there is a way. To the rescue came ‘Three Musketeers’ in the form of Stéphane Ratel, Patrick Peter and Jürgen Barth and they launched the BPR Series in 1994, having dabbled with mixed GT Racing in the previous season. BPR was firmly aimed at the gentleman driver as opposed to factories, providing 4 hour GT races with 911s and Venturis as the staple diet on track, with the spice being provided by a few Ferrari F40 LMs. Barth, an ex Le Mans winner, was Manager of the Customer Competitions Department at Porsche, Peter was a well respected race promoter and Ratel was an executive/investor in the wildly successful Venturi Trophy project. 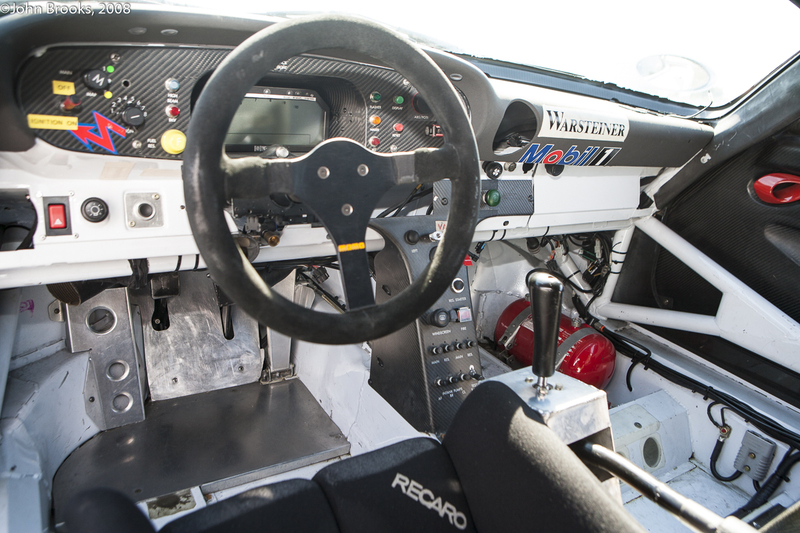 In 1995 the BPR expanded in both numbers and importance with the début of the McLaren F1 GTR at Jerez in February. Of course the arrival of the Woking super-car made the 911 somewhat second class, even in the fearsome GT2 spec. A BiTurbo variant was explored but in reality there was no way that a 911 was going to get on terms with a F1 GTR with its carbon fibre chassis, mid-engined layout and central driving position. 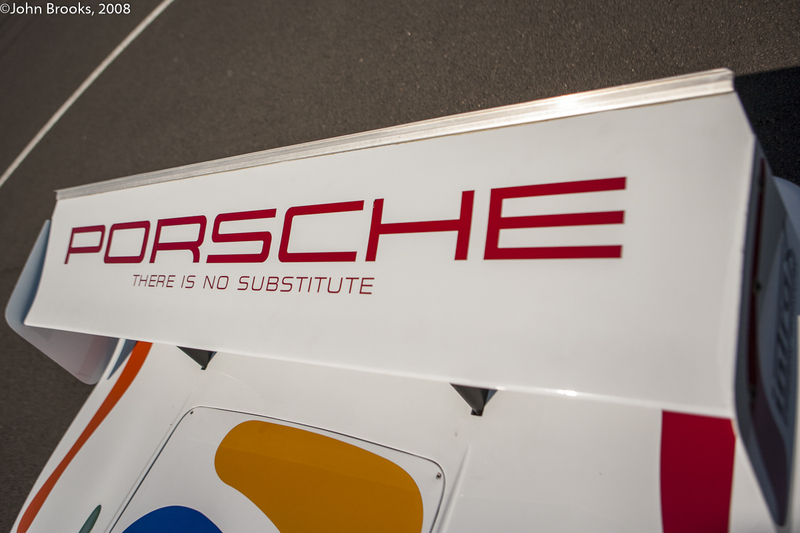 Finishing down the order is not what Porsche or their customers had come to expect, so as the saying goes “Something must be done”. The obvious solution was to create their own mid-engine racer, which had as much in it in design terms from the 962 as the 911, no matter what was said at the time. The front unibody and windscreen (derived from the current model 911 (993) and taken from the production line) was attached to a steel sub-frame and behind that was a 3.6 litre twin turbo engine. In reality the 911 was a proper racing car but in order to get the car homologated as a GT car a road going version had to be produced. This completely undermined the principles that BPR had hitherto been run on, ie. take a real road going GT and adapt it for the track, not homologate a racing car for the road. It would prove the undoing of a very fine race series. 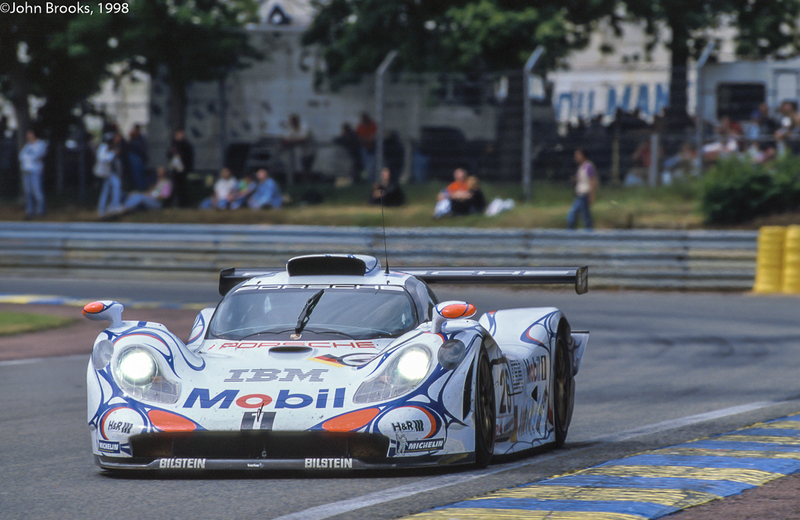 Initially the plan was to run the car at the 1996 Le Mans with outright victory the aim. However the opposition was not just the slower GT cars such as the McLarens and F40s but also prototypes such as the Ferrari 333 SP and the TWR Joest Porsche WSC95. The latter would prove to be too well run, too fuel efficient and too fast for the Werks GT. 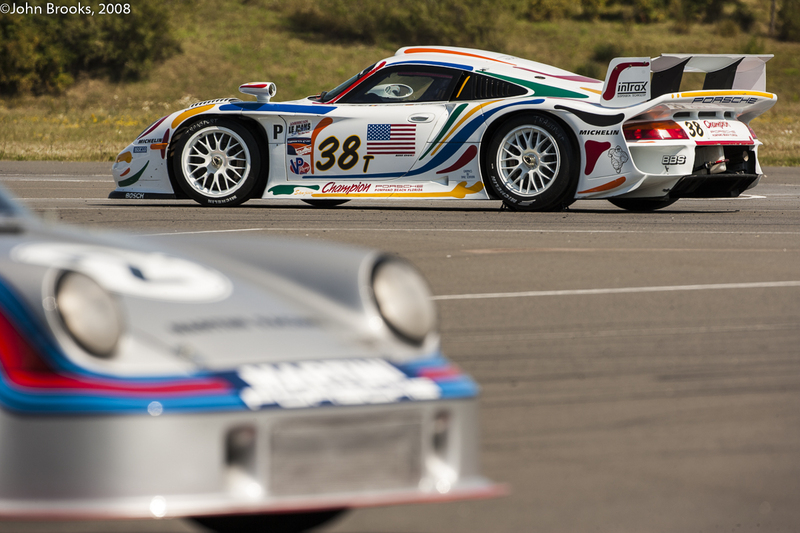 So the 911 GT1 had to settle second and third overall, triumphant though in the GT class. After La Sarthe the fun and games really started. 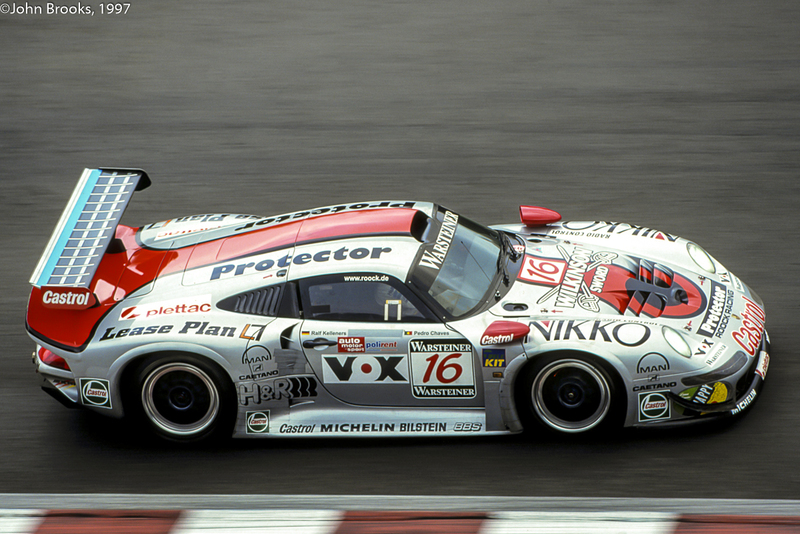 Porsche stepped up the pressure on the BPR to allow the 911 GT1 to race in BPR, Jürgen Barth’s position was somewhat compromised with his dual roles and conflicted loyalties. The existing teams, still reeling from the drubbing they had received in France, were adamant that the 911 should stay away, it was not eligible they argued and was outside the spirit of the regulations. 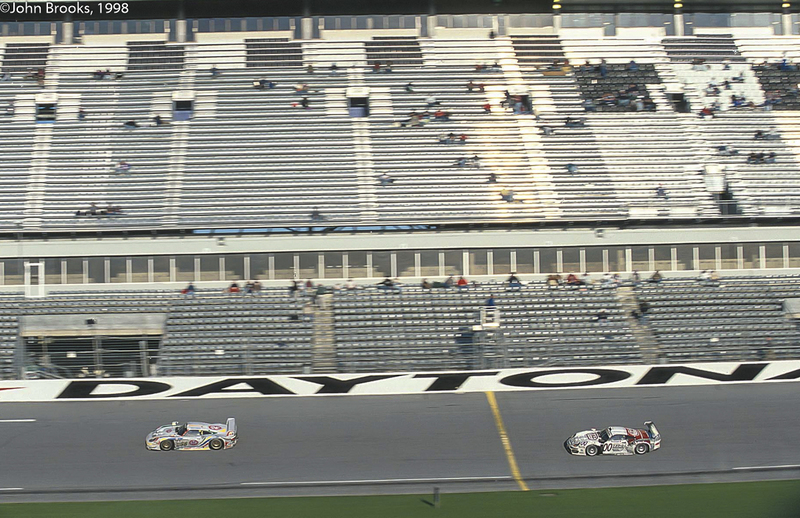 As a temporary solution, and in order to not destroy the 1996 title race, eventually the Porsche was allowed to start but would not be able to score points. At the first race after the decision held at Brands Hatch, Stuck and Boutsen drove away from the opposition as if in a different class, a feat that they repeated at Spa a few weeks later. It was a Sunday drive in the country with both pilots barely breaking into a sweat. 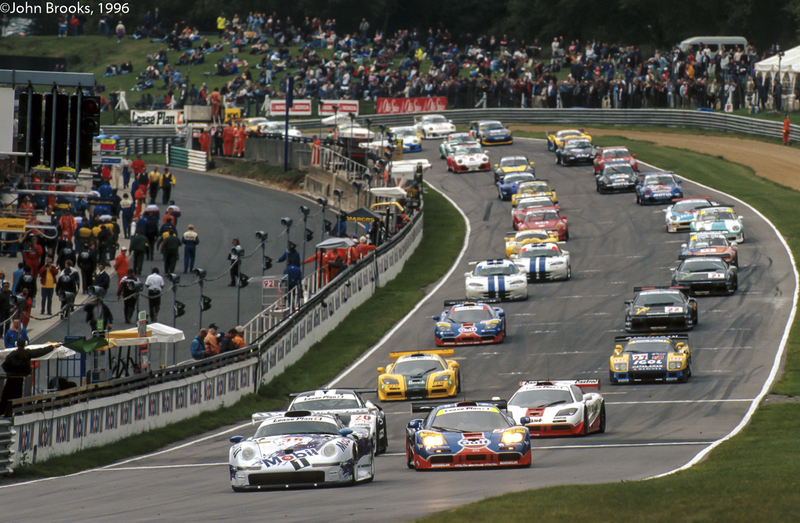 From the outside the 1997 FIA GT Championship was fantastic, factory supported GT racing featuring super-cars from Porsche, BMW, Mercedes, Lotus, Chrysler and Panoz. But there was a rotten core to all this, in theory a road car was to be built as the foundation for homologation of the race version but the time limit for presenting the road car to the FIA was eventually set at December some months after the Championship was decided. Mercedes-Benz took only presented their road car for inspection months after winning the title, a contemptuous gesture. Naturally BMW were outraged at the advantage handed to their rivals from Stuttgart just as the season got underway and planned to head for the prototypes arena in the future. As to Porsche, they did not fare so well either, with the regulations on engine power favouring normally aspirated entries. Despite a development to an Evo specification (at a significant upgrade cost!) they were not really competitive with the Schnitzer McLaren BMWs or the AMG Mercedes squad. Furthermore they had sold eight cars to privateers who also found that they were bog slow for a Porsche, and having spent a small fortune, collectively they were not happy bunnies. So as ever Porsche looked to victory at Le Mans to rescue their season, a win in the French Classic covers a multitude of sins. The main opposition was again the prototype Ferrari 333 SPs and the TWR Joest Porsche plus a trio of Nissan R390s run by TWR as well as the familiar McLaren brigade. 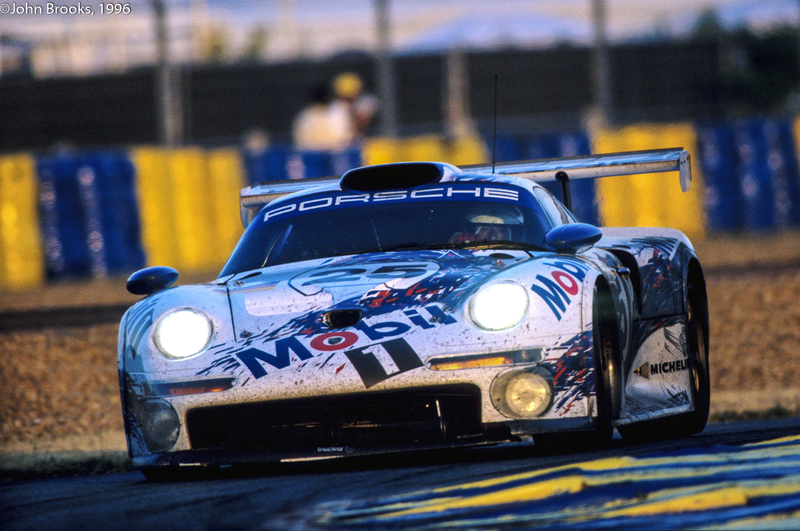 The tactics of the 1996 winners had been taken into account by the Werks, now the 911 GT1 had the speed and the fuel economy to handle the Joest car, did it have the reliability? The simple answer was no. Bob Wollek hit the barriers at Arnage with 8 hours to go while comfortably leading his team mate and the rest of the pack, a driveshaft failure caused that disaster. 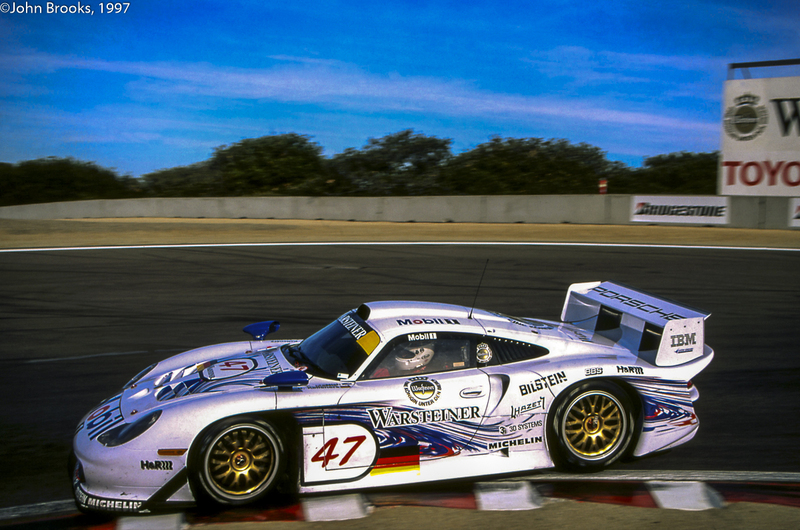 Some six hours later Ralf Kelleners was in cruise mode heading for the Chequered Flag when cresting Les Hunadières Hump, swarf in the oil cooler caused a pipe to burst and the 911 GT1 went up in flames, leaving the way clear for a second Joest win. Incroyable! 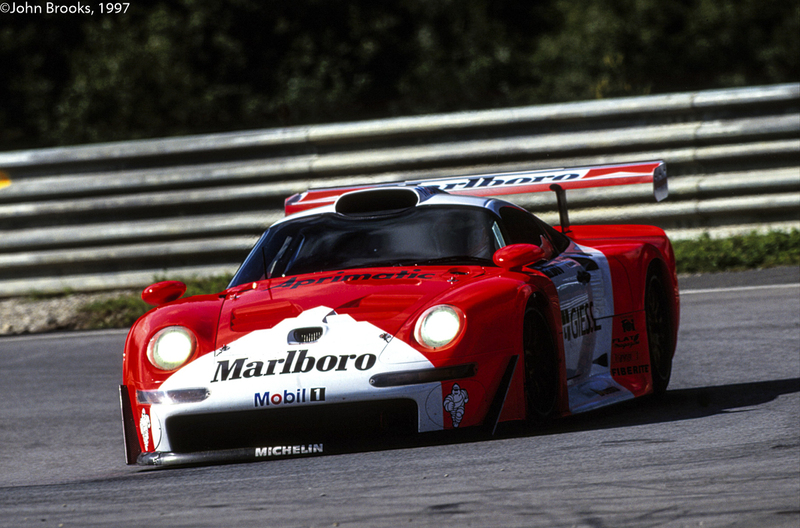 The disaster of 1997 led to the development of the 911 GT1 98 for the following year. Initial reliability issues handed the AMG Mercedes team the first two races and thereafter with the introduction of their CLK LM it was a clean sweep for Stuttgart in the FIA GT Championship. At Le Mans however the reverse was the case. Mercedes and BMW were out before sunset on Saturday, Nissan were too slow, leaving a straight fight between Porsche and Toyota. 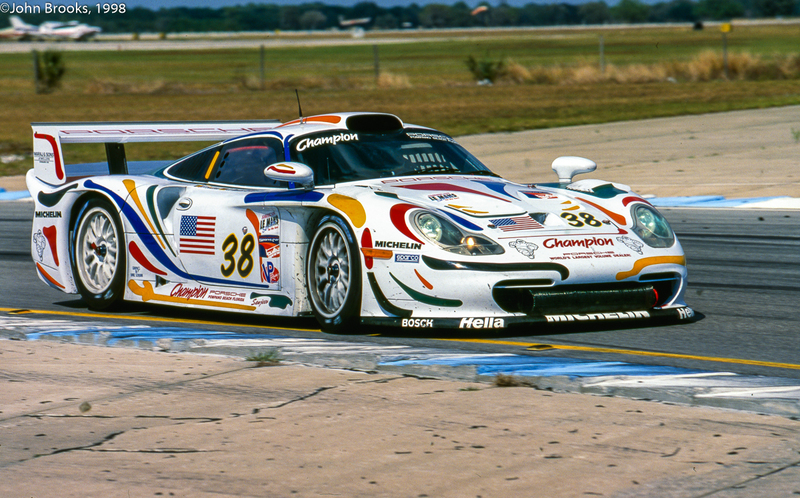 Against all odds Porsche triumphed………..who remembers the ’98 FIA GT Championship now? 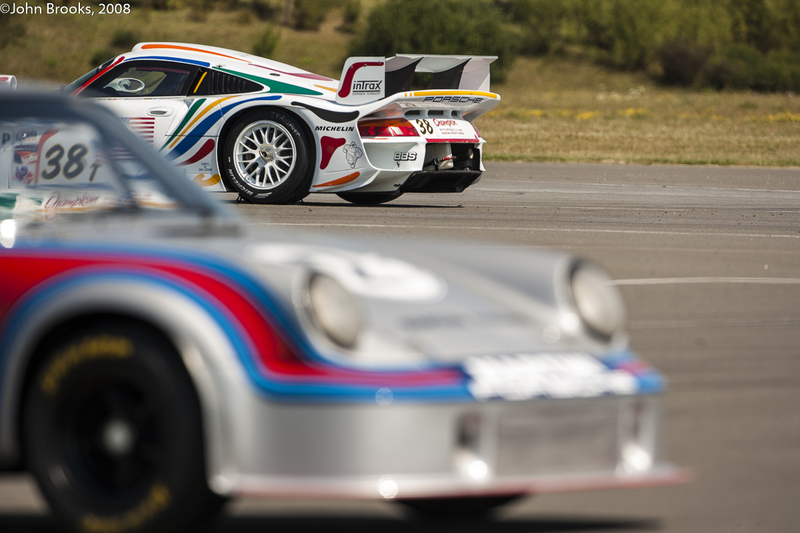 The old 911 GT1s were stuffed into barns or sold across the Atlantic. 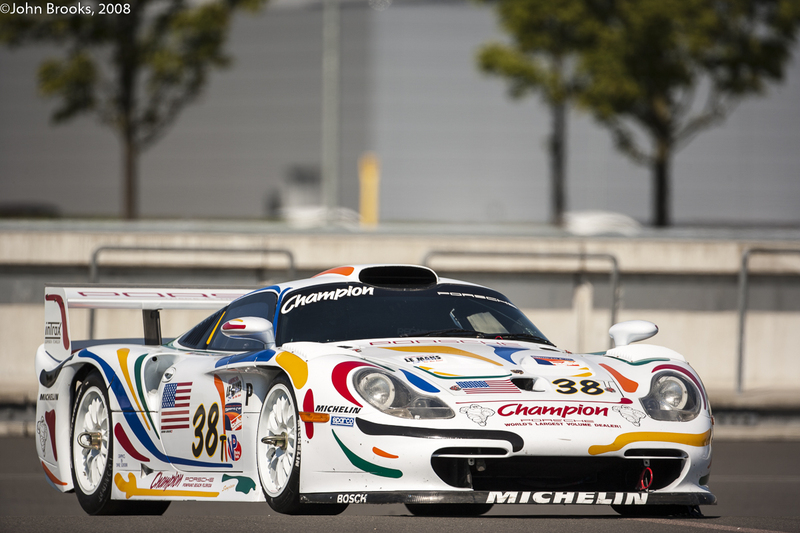 In North America for 1998 there were a multitude of series and races sanctioned by SCCA, USRRC Can-Am and PSC that the 911 GT1 appeared to be eligible to race in. 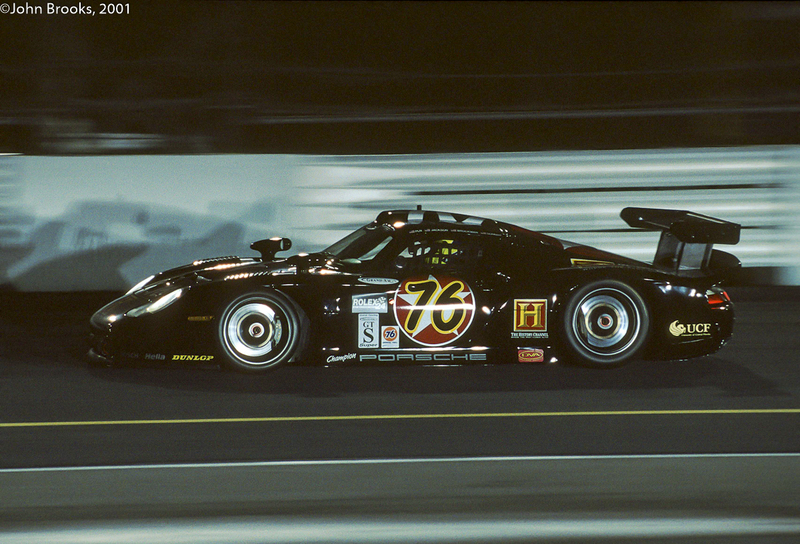 And this how I first encountered the Champion car, at the 1998 Daytona 24 Hours. 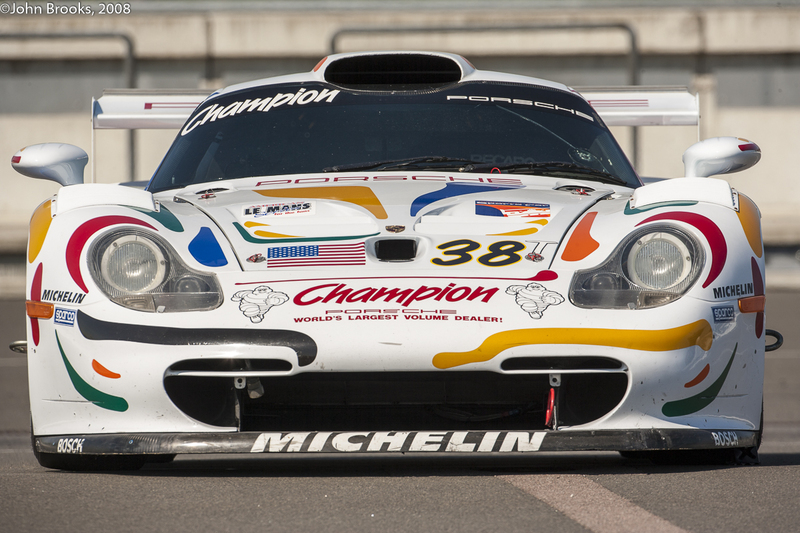 At that race there were two other 911 GT1s, an Evo entered by Jochen Rohr and a old spec car for Larbre Compétition. Late rule changes (imagine that at Daytona!) 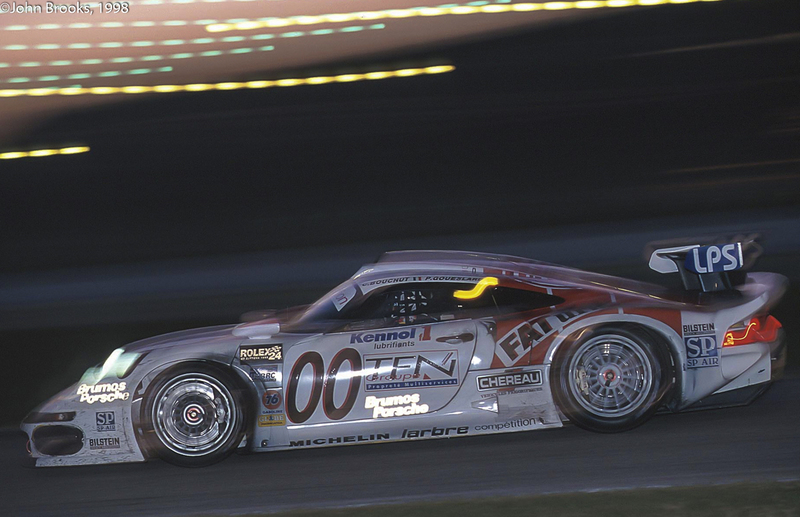 imposed on the GT1 class, and aimed at the Panoz GT effort, effectively excluded them from a real shot at overall victory. Politically it was expedient for a prototype to be the car driving into Victory Lane at the Daytona International Speedway and certainly not one of Doctor Don’s cars. Despite there being three Ferrari 333 SPs and a brace of Dyson Riley & Scott Fords, all of whom had much greater pace than the Porsches, the GT1 nearly snatched victory in the time honoured tortoise/hare mode. Late in the race suspension problems for the Moretti Ferrari 333 SP caused a few missed heartbeats but repairs were completed in time for the Italian to take a very popular win. Second place was the reward for the Rohr Motorsport outfit with their 5 driver (?) team of Allan McNish, Danny Sullivan, Jörg Muller, Dirk Muller and Uwe Alzen who finished 36 laps up on the Larbre 911 back in third. 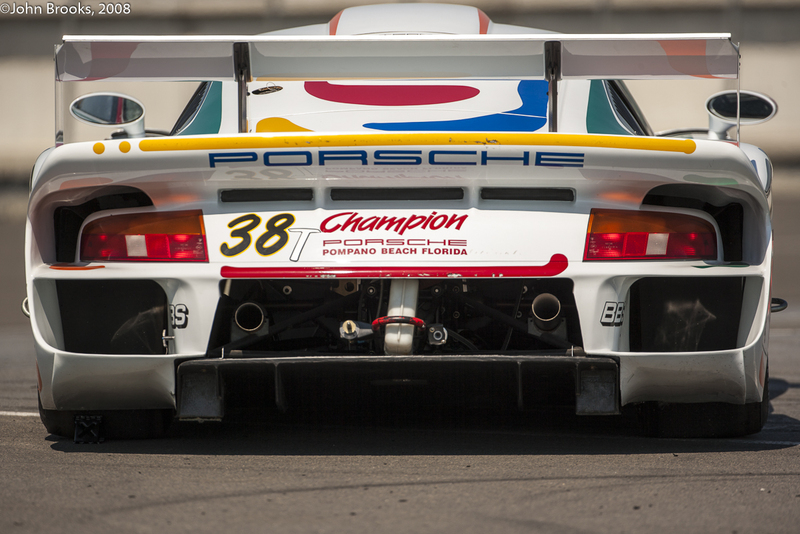 The Champion car retired with overheating issues – very un-Porsche like. 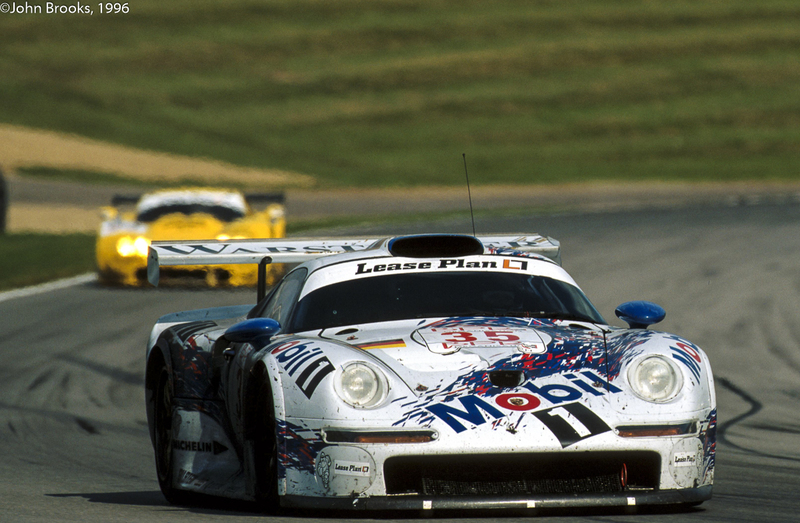 My next encounter with the Champion car was at the inaugural Petit Le Mans held at Road Atlanta in the fall of 1998. 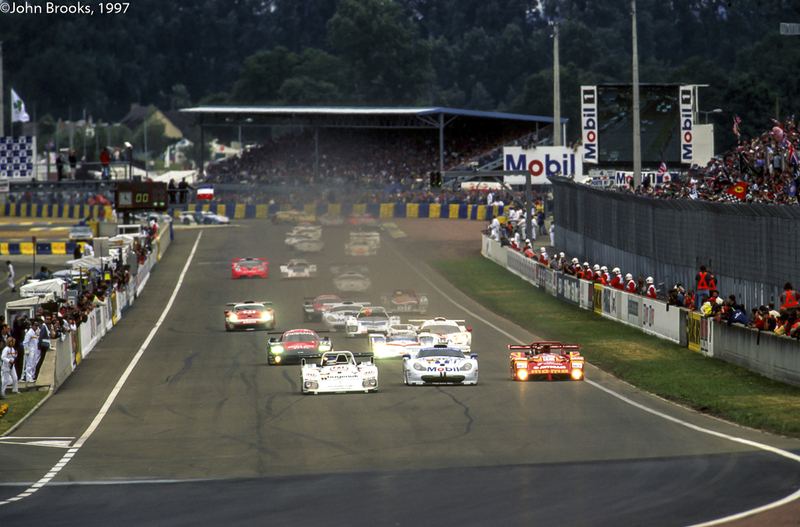 This race was to be the overture for the American Le Mans Series, which was so successful till 2013. 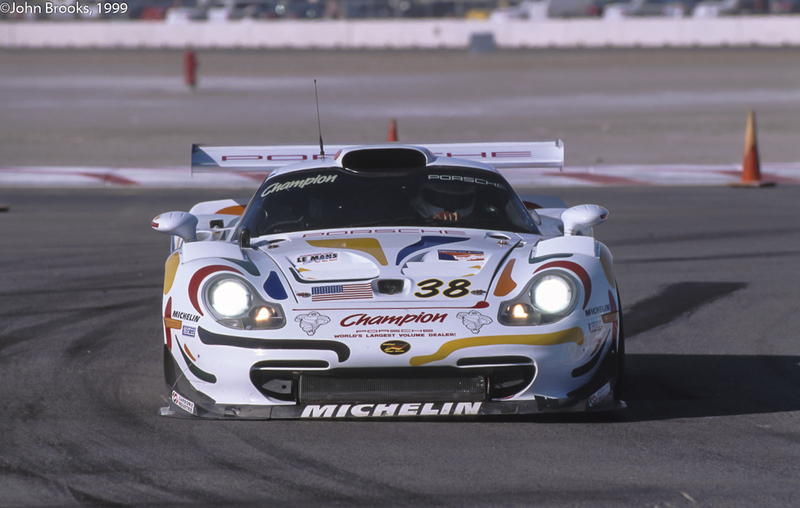 The day-glow car was outclassed by the more modern GT1 cars such as the factory GT1 98 and the Panoz GTs but at the finish the old girl was still there up on the podium with a third overall and another class win. It had not fallen apart or flown unlike its more modern rivals. 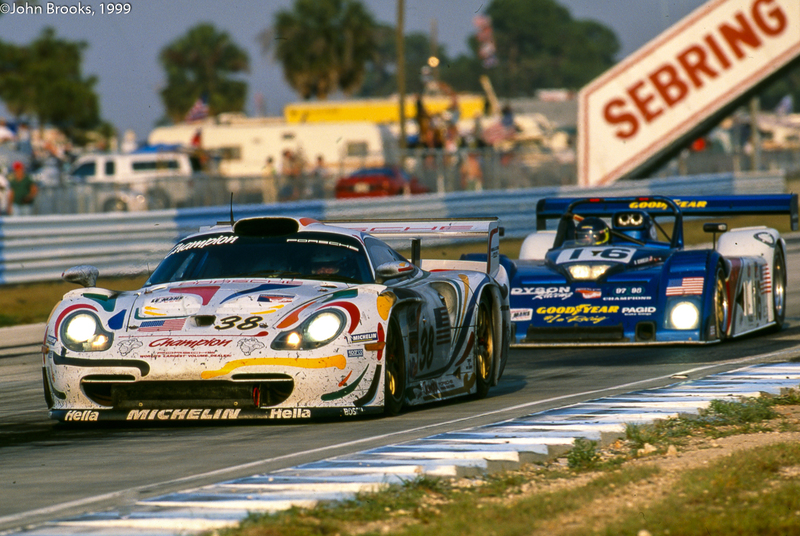 And that might have been that, but Dave Maraj’s car reappeared at Sebring in 1999 to challenge for the GT class of the ALMS, except that the 911 GT1 Evo was judged to be a prototype and forced to compete with the BMWs, Audis and Panoz in the top class. So despite having Thierry Boutsen, Bob Wollek and Dirk Müller to steer the beast there really was no hope of a decent result, a fourth place was as good as it got in 1999. 1999 was the first season of the ALMS and like many Europeans I flew back and forth across the Atlantic as the races had a strong European element to them, the series was always been cosmopolitan by American standards. 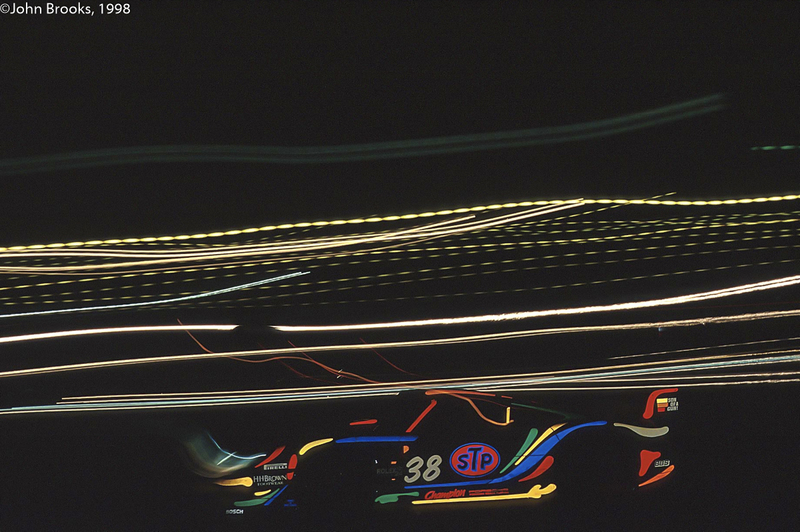 Sears Point, Portland, Laguna Seca, Las Vegas – the circuits rolled on and on, the air travel getting less and less “Jet Set” as I clocked the miles clocked up but still #38 would be present in its dayglo warpaint. Even Allan McNish could not drag the Champion 911 on to the podium, it was time for retirement. 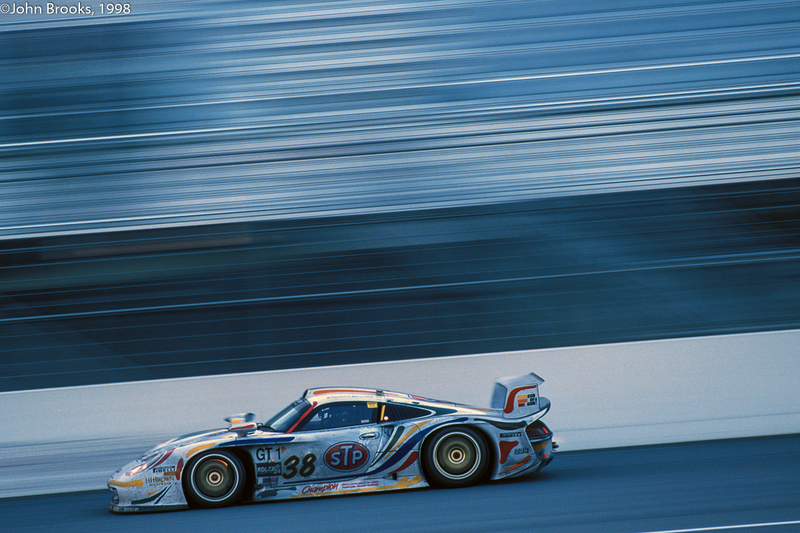 Except that it wasn’t, #005 reappeared at the 2001 Rolex 24 run by my old mate, Kevin Jeannette. His underrated son, Gunnar was lead driver, supported by Wayne Jackson, Mike Brockman and Paul Newman, yes THE Paul Newman. An oil leak forced the old girl into retirement and somehow she was shipped back to the factory for me to encounter some years later. The Porsche 911 GT1 has come to symbolise a wild era in endurance racing, when the factories slipped the leash of the regulations to create some of the greatest Gran Turismos ever built. I am grateful to have been a witness to this period of excess. 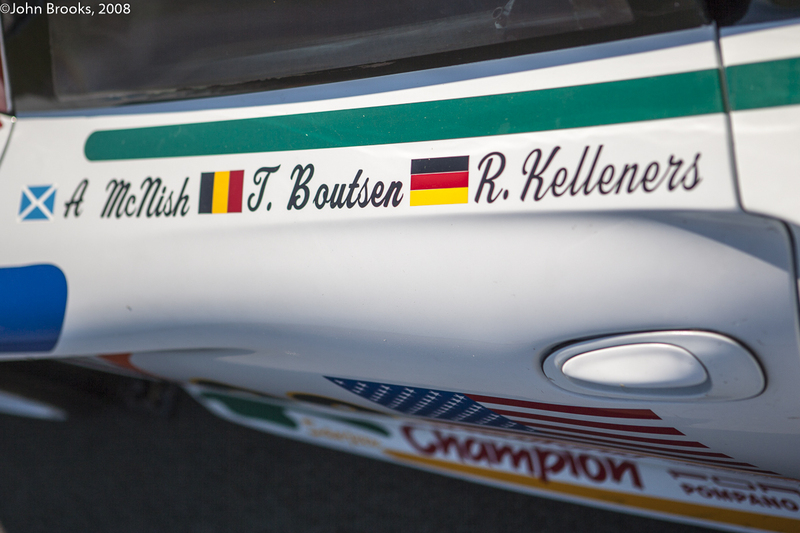 This entry was posted in Nostalgia, Notes from the Cellar and tagged BPR Global GT Series, Champion Racing, Daytona 24 Hours, FIA GT Championship, Gunnar Racing, Le Mans 24 Hours, Porsche 911 GT1, Porsche 911 GT1 EVO on January 20, 2017 by John Brooks. Super article John and great pix to boot. 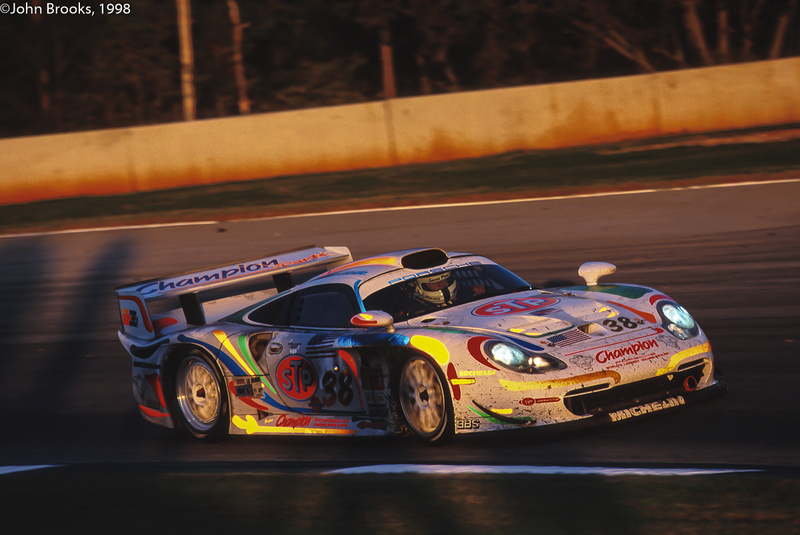 That was such a charismatic era of racing, hope to see some of those GT1s in the new Masters series…? Thanks glen for the kind comments, I appreciate it coming from you. I am trying to get some new content up but other work keeps getting in the way. I am sure that we will see the GT1 class well represented in the new series……….I am going to miss the Brands Hatch test as I am in Essen. 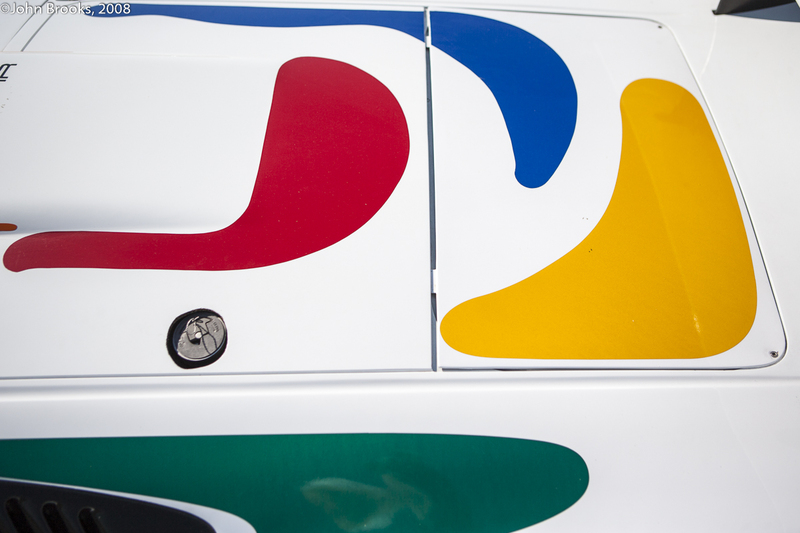 You at Rétromobile or London Classic car Show? Thank you! Superb photos of a beautiful car! 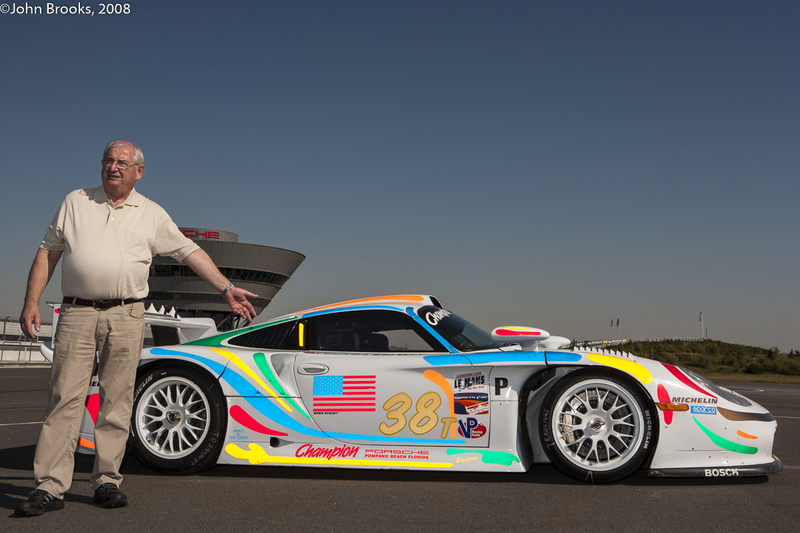 Thank you for sharing your story and bringing back wonderful memories of a amazing time in sports car racing!